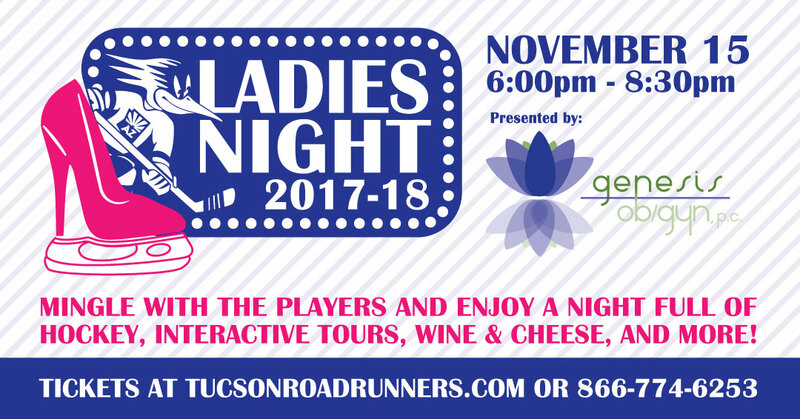 TUCSON, AZ – The Tucson Roadrunners shared information regarding their second annual Ladies Night today. On Wednesday, November 15 the club is joining forces with Genesis OB/GYN, offering ladies the chance to experience many aspects of the game first-hand and mingle with players and staff. Admission, which is $30 for season ticket members and $40 for non-season ticket members, includes a ticket to the team’s game on Friday, November 24th against the Stockton Heat, a Roadrunners t-shirt, wine and cheese at the event and a chance to win a team autographed jersey. A portion of the proceeds will benefit Roadrunners Give Back, the team's charitable foundation. Attendees will receive one raffle ticket for the jersey at check-in and can purchase additional tickets if desired. Activities at the event, which will take place at Tucson Arena, include the opportunity to shoot a puck on the ice, an exclusive tour of the locker room, a demonstration of some of the most exciting game operations and a wine and cheese mixer. For more information on the event, contact Julie Edwards at (520) 777-6717 or Chandler Atkins at (520) 777-8150. Single game tickets for all 33 remaining Roadrunners home games are on sale now by clicking HERE or visiting the Tucson Convention Center box office. Groups of 10 or more may book now for preferred nights and are additionally encouraged to contact the team at 1-866-774-6253 for more information.